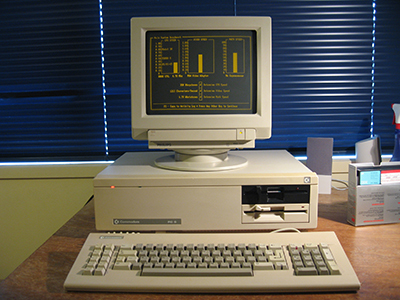 The introduction of the IBM-PC in 1981 changed the face of microcomputing forever. Not only did it legitimise small desktop computers as useful tools for corporate big business, but it spawned a plethora of legal, less expensive work-alike machines which (for better or worst) bought compatibility and order, first to the business market then eventually to nearly every area of computing. Only the Apple Macintosh line held out, and just by its fingertips. What many forget is that "PC-compatibilty" owes itself not just to the IBM-PC, but also (and perhaps more so) to the clone machines which numerous companies spat out during the 1980s. Collectively they numbered way more than genuine IBM machines. This established a huge user base for MS-DOS/PC-Software which was just unstoppable. As a group "the PC-Clones" embedded the PC-standard and screwed it down tight. The Commodore PC-5 released in 1984 represents such a machine, which is why I have one in my collection. 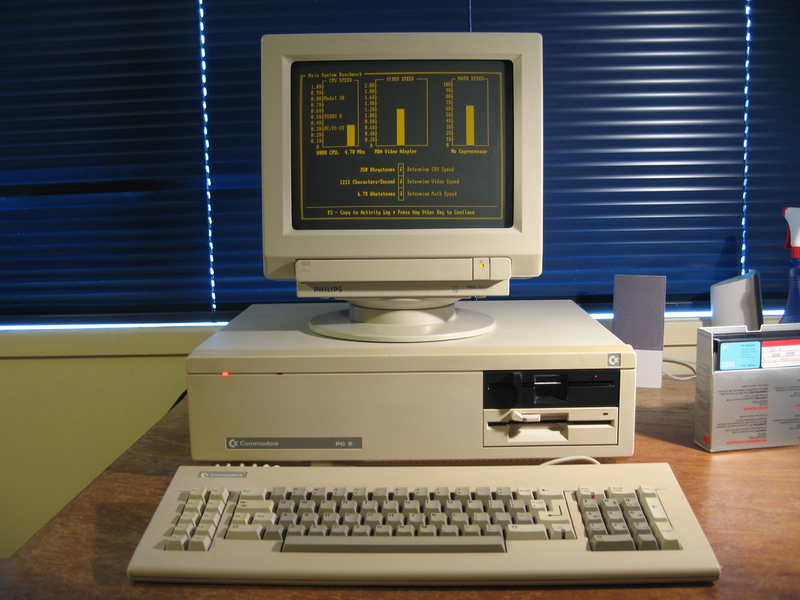 Typical of many entry-level PC-clones of this time, it is a monochrome IBM-PC look-alike with a few improvements. First it had 512k RAM on-board (expandable to 640k) as opposed to the meger 256k found on the later 1983 IBM-PC variant. RS232 and parallel printer ports were on the motherboard rather than on separate cards thereby making more slots available. There was also room to install a hard disk. I like the smooth lines and minimist look of the micro. It's uncluttered and uncomplicated. The stock model came with just one floppy disk fitted but you can see by the photo that mine has an extra optional one. I've also dropped an XT-CF-Lite hard drive emulator into one of the slots so to a user it appears to have a hard drive. More on the machine and how it came to me can be found here. While it's typical of a 1983/84 clone machine this particular model is actually quite rare; much less common than the Commodore PC-10, which has a color/mono graphics card and 640k on-board . Originally I wasn't going to add the PC-5 to the collection but it represents a class of computer worth noting i.e. the IBM-PC clones. The clones should be remembered for the influential players they were.